Are you all getting ready for Fall? Me too, love this time of year and looking forward to some cooler temps and much less humidity. I always look forward to September for that reason alone and it seems to usher in the road to the holidays and I love that time of the year so much as well. In the meantime, the house is coming along so well. The granite went in on Friday and I can’t wait to show you. Squeaalllll! It looks so good and I’m just thrilled with how my kitchen is coming together. I’ve got plumbing to hook up in there and a subway tile backsplash to get completed and then it will be move-in ready. Also, working on the bathrooms, prepping the walls for paint and those will be done soon too. 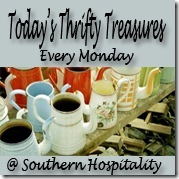 But, it’s time for Thrifty Treasures today and here are some highlights from last week! There are some great ones. At Home on the Bay found some beautiful blue and white enamelware bowls by Catherine Holm, collectibles for sure, for only $15. These are so pretty! My new friend, Dagmar, who I met at BlogHer in NYC, is a thrifting diva and scored big time on this pretty French dining set, for only $60. Can’t wait to see what she’s going to do with it. These vintage Danish lamps with marble bases were found by A Living Space, pros at finding the deals. Husband and wife DIY team, The DIY Village, scored big time on a bundled set of furniture they hunted down on Craigslist. This chest was ho-hum in brown stain, but now it is a big WOW. Love this paint treatment they did to it! This beautiful marble bowl almost got passed up by Revisionary Life, but she went back to the thriftstore and brought it home. I love, love this bowl and marble has always been special to me too. Petticoat Junktion took a plain maple hutch and turned it into a beautiful shabby chic cabinet by using my friend, Miss Mustard Seed’s, new milk paint. Gorgeous! This dorm room thrifty redo is in my backyard right here in Marietta! Shanty Insanity helped her college student move into Kennesaw State University dorm room for the new year and I love the gallery wall done with flea market finds. So cute! Remodelando la Casa found some great silver vintage pieces at a flea market for only $10 for the lot. Nothing like the gleam of old silver! There are a TON of parties out there to highlight all your projects, so please let’s keep this one about thrifty finds that were bought 2nd hand! Not a great sale from the store, or a recipe, or just a plain project, but 2nd Hand finds only! And please DO NOT go back in your archives to OLD posts and link up. Let’s keep this party fresh and current! If you have already shared your find in a previous Thrifty party, DON’T share it again! Please, girls, I don’t want to have to delete links. What a nice surprise to see those tarnished silver pieces included in the features today! Thanks Rhoda! Thanks for hosting! I enjoy seeing what everyone finds! I need to start sharing my own. Yep, gotta do that. Have a great week, Rhoda! What a terrific silver find for $10. Love that marble bowl too! Happy Monday, Rhoda! Love these features. That cabinet it to die for! No dumpster dive finds to share this week, but so excited to go through what everyone’s sharing! Have a wonderful week and LOVE those stairs! Your house is shaping up beautifully. I am ecstatic to have found our Woodland Dresser featured on this week’s Thrifty Treasures! I honestly think this is the pinnacle of my blogging career! Thank you for taking the time to host these link ups and for giving all of us a place where our work is appreciated! See you in October at the Southern Blogger’s Conference! Thank you so much for hosting, Rhoda! Your kitchen is looking great! !